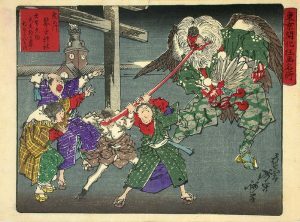 Tengu aka heavenly dogs comes as the Japanese mythic creatures with red human face and long nose being supernatural monster-spirits. Sometimes this character was presented with the wings as a half-human and a half stork one, thus, showing both human and avian capabilities. Ten-gu was known to be fabulously strong and most often is found wearing the outfit common with the Yamabushi hermits residing in mountains. Ten-gu people awe ere deemed to be the spirits wondering in or around mountainous area. 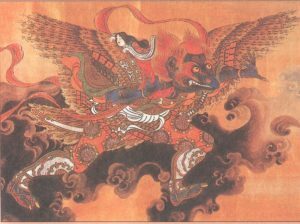 People believe that Tengu strived to disturb the peace on the Earth; they provoked to war actions, triggered fire and hurricanes. They were assumed to be wicked creatures that made every endeavor to harm people. Nevertheless, the legends say there were Tengu people with noble and generous hearts who protected the temples and sacred people. Ten-gu people were supernatural and they were highly skilled in the art of war actions and especially in cold arms using, becoming mentor for people deemed to be well-deserved by them. They were believed to be exceptional warriors though in personality they came as very resentful people who could not stand for vanity and haughtiness. It’s believed that a person known to be too arrogant or malicious can turn into a Tengu after death. Ten-gu creatures were associated with the ascetic Shugendo, picturesquely depicted in the recognizable outfit of its followers, the Yamabushi. The Temple of Clear Water in Kyoto is one of the most popular temples in Japan, visited daily by thousands of tourists and pilgrims. The temple represents a Buddhist temple complex with a ritual waterfall, guarded by Fudo Myoo (“immovable”), a Buddhist deity, protector of warriors in Japanese mythology. Since Japanese mythology was greatly influenced by Indian Buddhism, Japanese myoos correspond to Indian Buddhism’s vidyarajas. Perceiving Buddhism mostly as a peaceful religion, a Christian may be confused with a terrifying look of this warrior-deity and take it for a representative of evil demons. No wonder — his eyes are sparkling angrily, two sharp fangs, one of which is pointed upwards and the other – downwards seem to warn: “Don’t approach!” However, in the Japanese mythology Fudo is a kind deity, belonging to one of 13 Buddhas, revered by the followers of Buddhism, especially in Japan. He is one of the most important 5 myoos in Japan. And, therefore, he is the first to call for when Buddhists need spiritual protection. To protect all living creatures, revealing Buddha’s teaching to them. To expel sickness and evil spirits from homes and temples. A protector and an assistant in reaching one’s goals. A protector of other Buddhas, especially Dainichi Buddha. To control temptations and carnal desires. To help people to struggle with ignorance and evil forces in order to become enlightened. 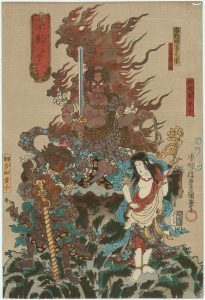 As it’s seen from the functions he performs, Fudo is a protector and a warrior, leaving no chance to the evil that tries to destroy spirituality. This is the reason why Fudo is most often shown with a sword (kurikara) in one hand and a rope in the other. These are his weapons against demons threatening the people he protects. With a sword he also chops delusions which happen to take control over people. With a rope he catches “bad” people and urges them to think about faith, setting them on the right path. The background for this Buddha-protector is flames, burning bad Karma. Flames also symbolize hell, same like the stone the Buddha sits on. The stone can’t give life to anything, equally like hell can’t give any hope to a person. Buddhists believe that those who get in hell can’t be saved. 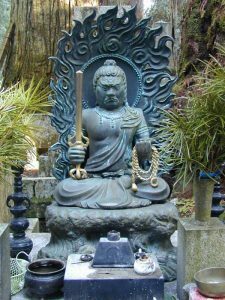 Thus, Fudo Myoo stays at the entrance to the hell to prevent human beings from getting inside. That’s why nobody, who has come to the Temple of Clear Water in Kyoto, can simply pass by the sacred waterfall protected by Fudo Myoo. Buddhists do ablution with this crystal clear water and pray to Fudo. This is a ritual of spiritual cleaning that promises the soul’s enlightenment, a feeling of quietness, peace and unity with the kind spirit of the goddess Kannon. So, don’t be frightened with Fudo’s threatening looks. There’s great and endless compassion of Dainichi Buddha behind it. 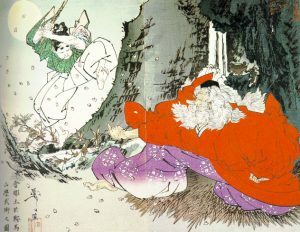 Yamabushi (One who hides in the mountains) was the name for the hermits of ancient Japan. They used to live in mountains and lead an austere life. Their life goal was to get enlightened using mystic practice techniques. Yamabushi were known for their perfect esoteric capabilities and they were recognized and reputed as qualified healers and holy people, on the whole. Being the adepts of the school Tendai, one of the principal Buddhistic schools in Japan based on the Chinese lotus school Tyantai and Singon founded by the monk Kukai, they supposed that they would get enlightened through spiritual contemplation, union of human beings and nature. Mountains were the perfect place for the hermit where the nature allowed devoting to cognition of yourself and the whole world around to the full extent. Yamabushi monks were not only devoted to perception being alone in mountains. They had, by the way, to survive from the mountain robbers and, thus, they mastered the martial arts and were highly qualified in using cold arms. However, naginata was the favorite kind of the edged weapons. Yamabushi were glorified to be perfect warriors using both esoteric practice and martial arts. 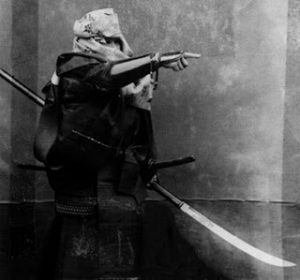 Sohei were the Buddhist monk warriors from feudal Japan. Back in the past for the particular time they were highly powerful. 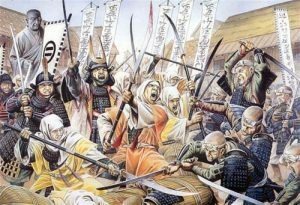 They were alike the mountainous ascetic Yamabushi, though being formed in bigger armies or subdivisions unlike Yamabushi. Sohei used to serve for the biggest cathedrals and abbeys and they acted like the European religious orders and communities as crucifiers, for instance, who used to crusade for the sake of churches. 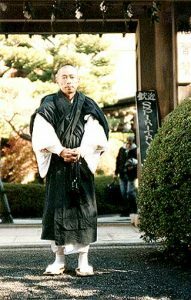 Sohei monks presented an influential part of the army and they never yielded to any military trained warriors like Samurai in the art of war. People were advocated to profess to recruit the biggest army and in their turn they were promised to be taught various martial arts skills. Like the mountain ascetic Yamabushi, naginata was the favorite weapon used by the Sohei monks. As warriors they were too severe and hawkish, rarely able to act kindly or mercifully. Enryaku-ji located on the Mount Hiei not far from Kyoto was established by the Sohei people. Enryaku-ji was also known as the home of marathon monks.